Do you want to rock out to music and your tweets? – Who Gave Them Money?! PSFK has a listing of the top 5 apps of the week, which lists some pretty interesting apps, however there is one app that doesn’t deserve to be anywhere near the top of that list. 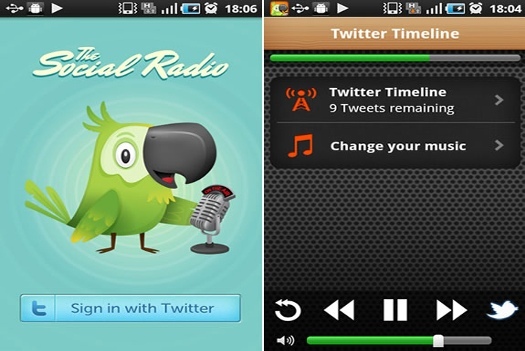 Social Radio, is an app that lets you listen to your tweets as they happen while you’re listening to music. If you have a twitter addiction and love listening to music then this app is just for you! No longer should you feel the need to actually look down at your desk and read anything, now your music will turn down automatically and you’ll hear your tweets from your favorite celebrities and comedic twitter users. I think that this is a very much un-needed app, if anything they are hoping to get bought out by twitter and should become a feature integrated into the main twitter app. But this is just another example of an app trying to get your data, stream music thru their application so that they get a few pennies, and is an app that just isn’t needed.